This Golf course of 18 holes, par 70 has been designed by Manolo Piñeiro, twice champion of the World. It has a maximum distance of 5.409m for gentlemen and 4.652 for ladies. In its construction the most advanced technologies in design of the systems for irrigation and drainage have been used in order to optimize the water ´s consumption. Salinas de Antigua Golf Club´s landscape is formed by hills and dunes which protect from the wind. 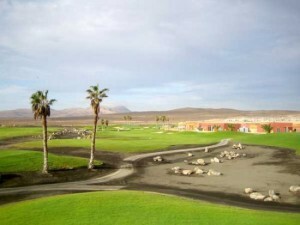 There are also deserts areas and four lakes which represent a surface of 21.450m2. Fuerteventura´s weather is aproximatly about 24ºC of average during the whole year. Its 152 beaches are the best of the Atlantic and it has one of the most modern hotel industry of Spain.